The promo tagline on the disc cover make this seem like it's a spin-off from the decade old "Young & Dangerous" series which propelled Ekin Cheng to stardom. But in true fact, "Heavenly Mission" is notches away from the metal-wielding gangsters' series. Ekin Cheng is no Chen Hao-nan but Autumn Yip (as cheesy as it sound but the name stays), a powerful triad leader who was sent to jail for 8 years and believed he can mend his ways after he is released from the cell. At the same time, an upcoming triad figure, Ghost (Stephen Fung) feels he has the potential to lead the triad further by dealing in arms smuggling. All these while, there's this Superintendent Sung (Alex Fong) who is watching the duo closely. 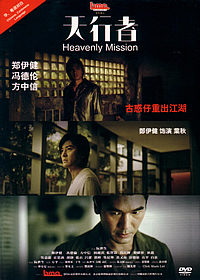 The most impressive thing about "Heavenly Mission" is the omission of the usual "gangster epics" cliches. There's no brutal gang fights, unnecessary vulgarities or even sexuality to speak of. Even the few action sequences are subtly handled. The leisurely-paced script by the director James Yuen brought out the excellent acting dough by the leads and also familiar faces such as Julian Cheung and veteran artiste Ti Lung. Seeing the charismatic male cast chewing up the screen is worth the price of this disc. It's just a simple story trying to bring across a simple message. But if you are expecting action stuff and elaborate setups, I suggest you steer clear of this. And please don't go after the marketers who wrote that misleading tagline. This Code 3 disc contains the original Canto track trailer in addition to Max Makowski’s One Last Dance and Derek Yee’s Protégé. Hooray for having dual tracks options for this disc. At least viewers have a choice of choosing their preferred track. The visual is decently transferred although some portions of the movie look grainy. Perhaps it's intended this way.